The 142 mile Schuylkill River Water Trail passes through mountains, farms, towns, and cities as it makes its way from Pottsville to Philadelphia. It is a River of Revolutions by contributing to the Revolutionary War, the Industrial Revolution, and later the Environmental Revolution to remove coal that choked the river. Always interesting, and visit to explore! Location: Southeastern Pennsylvania from Pottsville downstream to Philadelphia. Counties: Schuylkill, Berks, Chester, Montgomery, and Phila. Numerous River landings and launches are available in the five county area. They are easily accessed from PA 61, US 422, and I-76, the Schuylkill Expressway. Visit the website below for more specific maps and information. 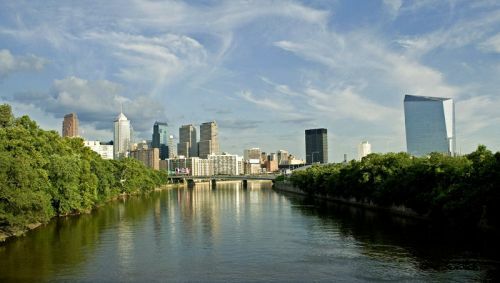 Runs the 142 mile length of the Schuylkill River to the confluence of the Schuylkill with the main stem of the Delaware River in the City of Philadelphia. Along the water trail, there are several places where landings for the Water Trail overlap with trailheads for the Schuylkill River Trail, the 135-mile regional land trail. The Schuylkill River Water Trail Guide was printed and available to the public in May 2002. The annual Schuylkill River Sojourn utilizes the Schuylkill River Water Trail for an exciting 7-day paddle from Schuylkill Haven to Philadelphia. And now communities all along the river are beginning to recognize the Schuylkill River Water Trail as both a recreational asset and opportunity.